An extension of the adjoint SU(5) model with a flavour symmetry based on the Z4 group is investigated. The Z4 symmetry is introduced with the aim of leading the up- and down-quark mass matrices to the Nearest-Neighbour-Interaction form. As a consequence of the discrete symmetry embedded in the SU(5) gauge group, the charged lepton mass matrix also gets the same form. Within this model, light neutrinos get their masses through type-I, type-III and one-loop radiative seesaw mechanisms, implemented, respectively, via a singlet, a triplet and an octet from the adjoint fermionic 24 fields. It is demonstrated that the neutrino phenomenology forces the introduction of at least three 24 fermionic multiplets. The symmetry SU(5) × Z4 allows only two viable zero textures for the effective neutrino mass matrix. It is showed that one texture is only compatible with normal hierarchy and the other with inverted hierarchy in the light neutrino mass spectrum. Finally, it is also demonstrated that Z4 freezes out the possibility of proton decay through exchange of coloured Higgs triplets at tree-level. 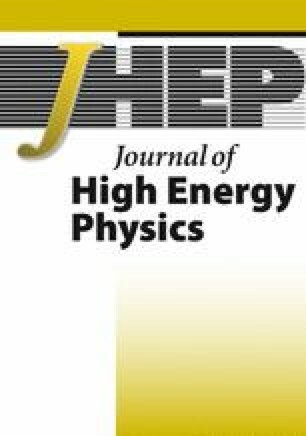 B. Bajc, P. Fileviez Pérez and G. Senjanović, Minimal supersymmetric SU(5) theory and proton decay: Where do we stand?, hep-ph/0210374 [INSPIRE]. T. Yanagida, Horizontal symmetry and masses of neutrinos, in Proceedings of The Workshop on Unified Theory and Baryon Number in the Universe, KEK, Tsukuba, Japan (1979), Conf. Proc. C7902131 (1979) 95 [INSPIRE]. M. Gell-Mann, P. Ramond, and R. Slansky, Complex spinors and unified theories, to be published in Supergravity, P. van Nieuwenhuizen & D.Z. Freedman eds., North Holland Publ. Co., (1979), Conf. Proc. C790927 (1979) 315 [arXiv:1306.4669] [INSPIRE]. J. Hewett et al., Fundamental Physics at the Intensity Frontier, arXiv:1205.2671 [INSPIRE]. Planck collaboration, P. Ade et al., Planck 2013 results. XVI. Cosmological parameters, arXiv:1303.5076 [INSPIRE].